You know what? After a while beer styles really start to taste the same. This makes me very happy, because this is a great beer in a great style. The nose is bready with light berry fruits; although it is a bit watery. A little bubbly hits the tongue and spreads the toffee, apricots and light peach all over the place. This is enhanced with a hearty dose of alcohol tingle. You would expect a medium weight taste like this to last for a while; oddly the finish is dry and lasts about 20 seconds. It is quite tart, like an apricot cider. This was a good Belgian triple. I would get it again; it can be had for a domestic price. Any night Meterman comes over and drinks beer is a good night. Yes, I did this to bump the score up. A solid, domestic Abbey Style Triple. Sure to please the converted and will not offend the purist. Flavius: EPI-PEN, EPI-PEN I need my adrenaline shot!! Meterman: For noobs sake, what now? F: I'm having an anaphylactic reaction to this beer. I'm sweating, having difficulty breathing and I'm blacking out. M: It is true that anaphylactic type reactions have occurred after the consumption of beer, but this is not your problem. You have fallen out of your chair and your fat cat is sitting on your face. F: Oh, that explains the sensation of the furry tongue. I picked this beer up in Seattle because it was mentioned as one of the top 50 beers according to Ratebeer.com. This is exceptionally smooth for a double IPA. The smell is as expected fresh pine, with light citrus (grapefruit/orange) hop and vanilla. Right at the start the hops bite you with pineapple and grass. The caramel/biscuit malt follows smoothly thereafter. At the end the hops revisit, but they are not very resiny. It is more a creamy citrus with light pine. This is one smooth brew. The fade is slow with lingering tastes of vanilla and grapefruit/pineapple. This brew is glorious, I plan to sample when I return. We finally finished Mercy on expert mode. It was odd that they old guys didn't die once. The accolades are well deserved. This is a very balanced and smooth double IPA. It is hard for a double IPA to be smooth, but this one has done it well. Flavius: Sorry Meterman more bad news for the bottle. The medical journal Lancet reported that approximately 4% of all deaths worldwide are related to alcohol. It is also thought that costs associated with these complications account for over 1% of a countries GDP. For Canada that means over $13 billion dollars a year. I know this sounds odd but it almost tastes red. Is is possible for colour to have a taste? Right out of the glass its starts with a slight bitterness mixed with good carbonation. The nose is lush with sweet caramel and flowery hops. After the initial bitter/fizz leaves, it is on to the next phase which is a full, thick caramel malt sweetness. Upon further tastings, one can pick out slight earth flavours and peanut butter. Just when you think it is all over, you are hit with a stealth hop bitterness. The bitterness is very tame. The tongue tingling from the bitterness/alcohol doesn't last very long. This is a great bitter/sweet ale, in the Irish style. I plan to get it again. More maps for L4D are pouring into the Nightware4Dead server research department. Aqualung has been kept busy. Anything by Moylan's brewery reeks of quality. If you like your ale's a little on the sweet side, try this one. Other notable Irish red ales include Smithwicks and Caffrey's. Flavius: I watched "Saving Private Ryan" but found the movie quite unbelievable. Meterman: Critics felt this movie truthfully portrayed the gritty horror that is war. F: I found it hard to believe that frontline soldiers had perfectly white teeth like Tom Hanks and Matt Damon. The nose was oddly faint, but there were little amounts of dark sugar, licorice and herbs. The taste is hard to describe, WOW. Alcohol creeps out of the glass and burns your palate clean; clearing the canvas. Then your taste buds are bombarded with all flavours dark and sweet: black currants, brown sugar, licorice, raisins and plums. There was a tequila like sweetness you could pick out. Every sip gave you a new flavour. It was not really a coating, but a vapour trail of cassis and black berries. It was oddly drinkable for a 11% beer. I will always have fond memories of this beer. This was the last beer of the Seattle session. A great ending to a great night of beer drinking. This an outstanding and complex beer. If I could only drink one more beer, this would be it. Flavius: Did you hear that Steve Jobs had a liver transplant? Meterman: This is concern that he used his fame and fortune to get a liver transplant quicker. F: Nope. Apple R&D department made this one. It's called the iLiver. I found this a little watery for a porter. The standard flavours were there; roasted coffee, grains, toast and chocolate. It just seems a little watery, but it was silky smooth. IBU 28. Thankfully it ended with a nice lingering of roasted grains and smoke. It was nice but I have had better. Still in Seattle, but getting a little tired after sampling lots of beer. If you like a milder, smoother porter you might like this one. This was a little sweet for a strong Belgian, but still enjoyable. The tastes and smells are similar; alcohol soaked cherries, plums, bourbon and brown sugar. Very full mouthfeel and complex; every sip provides new flavours. As it warms up a little spice and earth rolls around. Surprisingly it fades dry and quickly for a big tasting beer. The aftertaste is like a spicy caramel apple. Big Belgian styles are my favourite and this one did not disappoint. What can I say it is a solid big Belgian style and meant to be shared. Flavius: Meterman is not here, so I shall go ahead and re-brand the blog. I will focus on the health aspects of beer drinking. After reading the book Problogger, I plan to specialize my blog and make a six figure income. Meterman: I figure you will make six bucks. M: ..with the voice of reason. F: Whatever. Apparently binge drinking, but not so much regular consumption of alcoholic beverages, is associated with a greater hip-waist ratio (WHR). A bigger hip-waist is considered to be the classic beer belly. In a recent study, over 28,000 people from the former Soviet republic were surveyed about their drinking habits. It was found that regular drinkers of beer or spirits (but not wine) had a slightly bigger WHR but not necessarily a larger body mass index (overall body size). This effect was thought to be slight and not very significant. What was significant was those people who reported binge drinking at least once a month, generally had a greater WHR that those that did not binge drink. M: So binge drinking, not regular moderation, can make you plump. F: Looks like. Binge drink is defined as consuming more than 80g of ethanol at one sitting. That is about a six-pack of regular beer (5%ABV). M: It could also be two and a half Rochefort 10's. I like a good bock, as long as it is not too sweet. The aroma is very sweet with lots of roasted caramel, smoke and cherry wood. This is a very sweet beer; lots of creamy toffee, roasted nuts, smoke and brown sugar. I'm sure there are hops there somewhere, but where? The wash is very sweet and the lingering of roasted caramel and toffee fades quickly. It is not noticeable through the sweetness. A very unique taste and I would certainly get it again. For those who like there beers a little sweet and strong, look no further. The beer in question is the closest one. 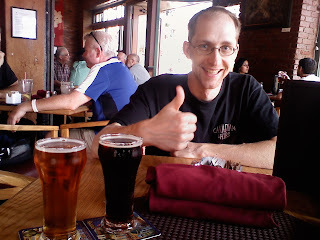 Meterman seems very happy with his choice of the Swan's Scotch Ale. The nose is quite pleasant with both floral and citrus hops. A hop assertive first sip lets you know that this IPA means business. After the hop bite is done, a wash of caramel barely sneaks in before the hops are back at it again. The hop finish is slightly citrus, but not grapefruit, more of a Seville orange. The bitterness lingers on for ages, imparting flavours floral hops that are not very astringent. This was a great PNW IPA and it surely will make a regular appearance in the ARC beer fridge. No gaming this afternoon; just Meterman and I draining some glasses at the best brewpub in Victoria. What can I say, Swan's brews good beers. This was enjoyed on tap at the brewpub. The nose is always better at the source; lemon/orange rind, yeast, grass but oddly no wheat noted. Each mouthful was very refreshing with a medium mouthfeel of grass, light citrus, slightly spicy and wheat. There was less carbonation than one would expect from a wit and usually creamy. The ending was dry and crisp, with just a slight wheat creaminess. Perhaps one of the best witbeers so far. I wish I had grabbed one from the CBAW next door. This was one of the few highlight of the ARC beer cask search. Perhaps you think Rickard's White is a true witbeer? No are wrong; this is a witbeer. This is a porter through and through; you can tell by the nose. It is smoky with roasted grains; like burnt whole wheat toast with coffee spilled on it, yet a little sweet. Over the lips.. nice medium body and oddly creamy. The tastes of roasted coffee, toast, toffee spread everywhere. These flavours are not overpowering and have a backbone of roasted malt sweetness. There is a long lingering of palate cleansing, roasted grains and burnt sugar. It does not coat but slightly dries out the mouth. This is one of the greatest porters I have ever tasted. If you like porter, you will like this one. It is safe to say than anything made my Deschutes is a great beer. Meterman: WTF has your head been this week. F: Hidden powers in Iran are thwarting the democratic process for their own financial gain. M: Right! They plan to maintain control of Iran's oil reserves. F: Nope, the clothing mafia wants to sell more of the cool jacket that Mahmoud Ahmadinejad always wears. Honestly, I do drink beers than strong Belgians. Big nose on this one; bready, grains, yeast and dried apricots. This is the way Unibroue is supposed to taste; very smooth with hints of fresh bread, yeast (not too much), apricots, spice (nutmeg and cloves). The body has a medium feel and a dry finish. This brew coats your mouth with a long lingering sensation of spicy bread. Oddly you can't taste it too much. This was a nice strong, pale Belgian. Much better that the Unibroues IMHO. This was another Seattle beer. I think Gord and I sat in the hotel room and played 'Lets drink good beer'. I thought this was a good pale (blond) Belgian strong ale. Much prefered over the Unibroue. Flavius: OMG did you hear that Michael Jackson died? Meterman: Yes, it is old news. He died in August 2007. F: No, not the Beer Hunter MJ, the King of Pop MJ. M: How is that relevant to anything? M: I bet they could put his body straight into a wax museum and it wouldn't degrade. F: Maybe in a few years they can dig him up and do a Thriller tour and not have to do makeup. The nose is oddly absent with just a faint alcoholic cherry, yeast and plum. Wow, the taste just jumps out at you. Right away you get the alcohol burn, which is only slightly ahead of sour cherry, bourbon, plum and caramel. It is quite intense. There is more plum and yeast presence as the beer warms up. The long alcohol burn carries caramel and yeast down the throat. The lingering is there until the next drink; which is never far away. It burns, but in a nice way, not like syphilis. Yup this one is a keeper, especially if you light strong darker Belgian style beers. This was a Seattle beer; after this Gord and I walked up to the Stumbling Monk Pub. Highly recommended if you are ever in Seattle. While not as good and Chimay blue or a Rochefort, it is a very close second. This beer was brewery exclusively for Canada, using Canadian whiskey oak barrels. Well now, this is something good. Massive nose of sherry, cherries, wood, vanilla and caramel. The taste is just like the nose but with added rye and fruit (raisin). Very smooth with a slight lingering of raisin and rye; quite dry. Oddly you cannot taste the ethanol, but you can feel the warmth and burn going down. Any special edition by Innis and Gunn is sure to please. At $5 for a 330ml bottle it is not cheap but worth it. Nope did not play, did ask what I did either. I can't remember; this beer was finished some time in June. I like a barrel aged beer, so this made my taste buds happy. Sadly it is a limited release, but I&G are always releasing something. The nose is thick with coffee, roast, toffee and light on the alcohol. The brew too is thick and coats the entire mouth. In this beer paint are intense flavours of vanilla, burnt coffee, dark chocolate, roasted grains and oatmeal. Only the slightest of alcohol tingle finished the mouthful. The taste is nice and strong for a stout, or any beer for that matter. The same flavours lingered on and coated the throat. Then it morphs into an intense bitterness; almost like day old bitter espresso. The good kind of bitter espresso, very long and a tad earthy. Various batches will have different alcohol contents. Luckily I got a stronger one. This is a great stout and one of my favourites. No gaming tonight, but I did transfer my first batch of homebrew for further fermentation. This sure to be a favourite for thick, burnt stout fans.